In part 1 of this post, we learned how Arondt Van Hook solicited member subscribers and opened the first Reading Room in America in October of 1797. This opening was well-received, and thereafter Arondt was known as Proprietor of the Reading Room. In 1798, with a membership list and a captive audience, Arondt decided to expand his literary business efforts and become a publisher himself. What better opportunity than to come out with a compelling new book and sell directly to the literate membership of the Reading Room, or to those that know of its reputation? In February of 1798, Arondt began advertising in the newspapers of the era (the New York Daily Advertiser, the Newark, New Jersey Centinel of Freedom, the Boston Federal Gazette, and the Philadelphia Gazette of the United States), offering a new book for pre-sale – An Appeal to Impartial Posterity, by Madame Roland. 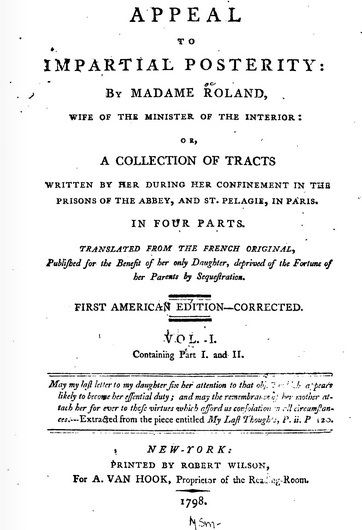 This book, a collection of the memoirs of Marie-Jeanne Philippon Roland, the wife of the minister of the interior of France’s King Louis XVI, may not sound exciting to modern ears. However, with the ongoing French Revolution generating intense debate (and outright brawls) in the United States, this book was a hot topic. Madame Roland was a forward-thinking supporter of the Revolution, and spent her last months in prison in Paris, and died November 8, 1793 by way of the guillotine (as her husband died a week later). The citizens of the United States were keenly interested in thinking coming out of France at this time. In 1798, the United States first funded a direct tax (based on real estate and slave ownership) mainly due to the threat of an upcoming war with France. An Appeal to Impartial Posterity was printed in the late spring of 1798 by Robert Wilson for Arondt Van Hook. It was published in 2 volumes, with buyers paying $1.50 for each volume. Apparently it sold well. It looked as if Arondt had found an exciting and profitable new career. Unfortunately, he didn’t live long enough to pursue and enjoy it. On Thursday, September 13th of 1798, the following notice appeared in the Daily Advertiser – “On Monday evening, in the 49th year of his age, after a fevere and painful illness, which he bore with great fortitude, Mr. Arondt Van Hook. He was an affectionate husband, a tender parent, a true friend to his country, and to the poor a generous friend.” Throughout the 1790’s, New York was suffering from periodic epidemics of yellow fever. The virus was spread by an urban dwelling mosquito (of course, no one at the time knew actually what caused the disease), and the symptoms were horrible and painful. Arondt’s obituary was also mentioned in other United States newspapers. What happened to the Reading Room? Advertisements appeared in the local newspapers in December of 1798 that a new Reading Room would be opening. Then the Farmers’ Weekly Museum (a newspaper published in Walpole, NH), in its January 7, 1799 issue on page 3 covering “incidents at home” stated: “The late… and enterprizing Mr. Van Hook of Newyork, was the first, we believe, who established a Reading Room in America. It was sufficiently encouraged during his lifetime, but, upon his unfortunate decease, it was closed, to the regret of lovers of literature. It is a pleasing and honorable circumstance to the inhabitants of Newyork, that an establishment, so useful, is revived. Mr. G. Painter has issued his prospectus of an arrangement of this kind, and proposes, on the first of the present year, to greet the reader with every variety of literary and miscellaneous information…” George Painter, a recent immigrant from London, opened the second Reading Room at 146 Water Street, across the street from Arondt’s closed establishment. His subscription and visiting prices were 30%-50% higher than Arondt’s. Posted in Uncategorized. Tagged with arondt, new york, reading room, van hook, VanHook. In September of 1797, a series of advertisements appeared over several weeks in the major New York City newspapers of the day (e.g., the Diary, the Time Piece, the Argus, the Minerva) offering subscription memberships to a new “READING SHOP” that was to be established in the city. This was cause for great excitement and interest among the educated populace, as this would be the very first such Reading Room in America (although back in 1731, Benjamin Franklin and some friends in Philadelphia pooled their funds to buy and share books). This offer was made by one Arondt Van Hook, a long-time resident of the city, who hoped to gain enough subscribers to make a success of his new endeavor. For fees ranging from 4 cents for a single visit to $1.50 for a 3 month membership – visitors to the Reading Room could immerse themselves in the most recent publications from the United States and Europe, including magazines, reviews, annual registers, handbills, newspapers, and a profusion of pamphlets. Additionally, all types of maps were hung about the room, and a small reference library of dictionaries, histories, biographies, law and geography was available. Arondt married Abigail Stevens in 1771, and they had 3 sons. The oldest son, Isaac Alvan was graduating from Columbia College (now University) with a law degree at the time of the opening of the Reading Room. The second son, William, also became a lawyer with a degree from Columbia, and the third son, Frederick, was a clerk in the New York Customs House – but died relatively young about age 29. During October, 1797, the Reading Room opened and was received to great success, with glowing reviews in the papers. It opened at 149 Water Street (site of the present day Wall Street Plaza building at address 88 Pine Street) to citizens and foreigners alike – as long as they were male. Located near one the busiest centers for commerce in Manhattan (the Tontine Coffee House – the precursor to the New York Stock Exchange), the Reading Room provided a quiet respite for patrons. According to contemporary reviews, strictest silence was observed in the Reading Room, and additions of reading material were constantly added. After filling their head’s with a “feast” of reading, visitors could adjourn to a room next door for refreshment of a “dish of coffee and a biscuit.” Subscriptions to the Reading Room could be purchased at the newspaper offices, at the Tontine and at city bookstores. The popularity of the Reading Room spread widely, as a proposal was put forth that fall for the establishment of a Reading Room in Baltimore modeled “nearly upon the same plan with that designed by Mr. Van Hook,” but with the addition of a circulating library. To be continued in Part 2 of this post…. Posted in Uncategorized. Tagged with arondt, library, reading, van hook.